Stan Kroenke, the billionaire owner of the NFL’s Rams, has agreed to purchase the historic W.T. Waggoner Estate Ranch in Texas, representatives of the ranch said on Tuesday. Terms for the purchase of the more than 520,000-acre estate were not disclosed. The ranch had been listed with an asking price of $725 million. District Judge Dan Mike Bird in Vernon, Texas, allowed the family owners of the Waggoner Ranch to proceed in a private transaction with Kroenke, one of the wealthiest owners in professional sports and the owner of ranches in Montana, Wyoming, Arizona, and British Columbia. The Waggoner went on the market in 2014 after Judge Bird ordered a sale to end more than 20 years of family litigation. Kroenke recently decided to move his National Football League team from St. Louis to a privately financed $1.8 billion stadium in Inglewood, Calif. Along with the Rams, he also owns the National Basketball Association’s Denver Nuggets, the National Hockey League’s Colorado Avalanche, Major League Soccer’s Colorado Rapids, and two-thirds of the English Premier League’s Arsenal soccer club. Kroenke’s fortune is worth about $6.2 billion, according to Bloomberg estimates. The Waggoner is the largest U.S. ranch within one fence, measuring 520,527 acres (210,650 hectares), or 800 square miles (2,072 square kilometers). The King Ranch, based in South Texas, has more acreage spread over several parcels. Located about 175 miles northwest of Dallas, the Waggoner sprawls over six counties and is bigger than Los Angeles and New York City combined. The asking price was more than four times the biggest publicly known sum fetched by a U.S. ranch, $175 million for a Colorado spread in 2007. 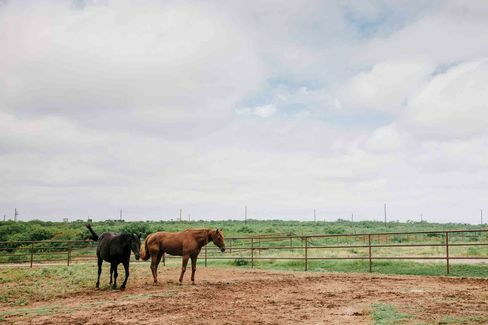 With 6,800 head of cattle, the Waggoner is one of the 20 largest cattle ranches in the U.S. and is known worldwide for its quarter horses, which number 500. The ranch also has 1,000 oil wells, 30,000 acres of cropland, and an abundance of deer, quail, feral hogs, waterfowl, and other wildlife. The Waggoner has been owned by the same family almost as long as Texas has been a state. A judge in Vernon, a town of about 11,000 near the estate, ordered a sale of the ranch in 2014. The order ended more than 20 years of litigation between opposing branches of the Waggoner family who couldn’t agree on what to do with the property. The ranch was developed by a cattle and horse man named W.T. Waggoner, son of Dan Waggoner, who started buying Texas acreage around 1850. By the 20th century, oil had been discovered on the ranch, and the Waggoner reverse-triple-D brand was a Texas icon. Trainloads of spectators came to watch President Teddy Roosevelt hunt wolves on the property. Will Rogers, the famous American humorist of the 1920s and early ’30s, visited frequently, sometimes playing polo. The brokers on the sale were Bernard Uechtritz, of Briggs Freeman Sotheby’s International Realty in Dallas, and Sam Middleton, of Chas. S. Middleton Son in Lubbock.